Test bed for two 14 MW Cyclo propulsion drives for delivery to the 70,000-grt cruise ship M/S Fantasy. Deutz MWM recently completed its 234Y series engine range with the introduction of a 16-cylinder, 1,400-hp model. The aim of the development was to build—on the basis of the favorable specific char- acteristics—power units which are especially suitable for megayacht and passenger vessel propulsion. Models in the 234Y range are available with six, eight, 12 and 16 cylinders covering a power spectrum from 337 to 1,030 kw (459 to 1,400 hp). The maximum power ratings for yachts and other fast ships range from 405 to 1,030 kw (I0FN - 0.5 h within 6 h), the continuous power between 337 and 858 kw (IC 20 N). The range of Deutz MWM yacht propulsion engines includes ex- tremely compact, high- and medium- speed diesel engines. These units meet the demands for low weight, small installation volume and smooth-running characteristics, combined with economy and envi- ronmental compatibility. Four en- gine series are available to cover a power spectrum from 20 to 3,935 kw (27 to 5,350 hp). The bottom end of the power range, from 27-300 hp, is represented by series 226B engines. They are available in two-, three-, four- and six-cylinder units whose maximum cylinder power is between 18 and 37 kw (24 and 50 hp), depending on whether it is a naturally aspirated or turbocharged version with or with- out charge air cooling. They are rated for speeds between 1,500 and 3,000 rpm. Powers up to 1,800-kw (2,448 hp) are covered by twin-engine installa- tions consisting of series 234 en- gines rated for 100 to 900 kw (136 to 1,224 hp), each at speeds between 1,500 and 2,300 rpm. The 234 series includes engines in vee-configura- tions with six, eight, 12 and 16 cylin- ders. Their best weight per unit power value in maritime duty is as low as 2.7 kg/kw (2.0 kg/hp). The power class up to around 4,500 kw (6,100 hp) is covered by the compact series 604B high-speed en- gines. These engines were launched in the market in 1985 and have performed well as propulsion units for fast ships. Their power range extends from 445 to 2,240 kw (605 to 3,050 hp) at speeds between 1,200 and 1,860 rpm. The optimal fuel consumption is as low as 192 g/kWh (141 g/hph). The company's product line is topped by medium-speed diesel en- gines distinguished by operating economy and smooth-running char- acteristics. The Deutz MWM en- gines of the 628 series are a good example, with more than 1,450 units sold since their market launch. 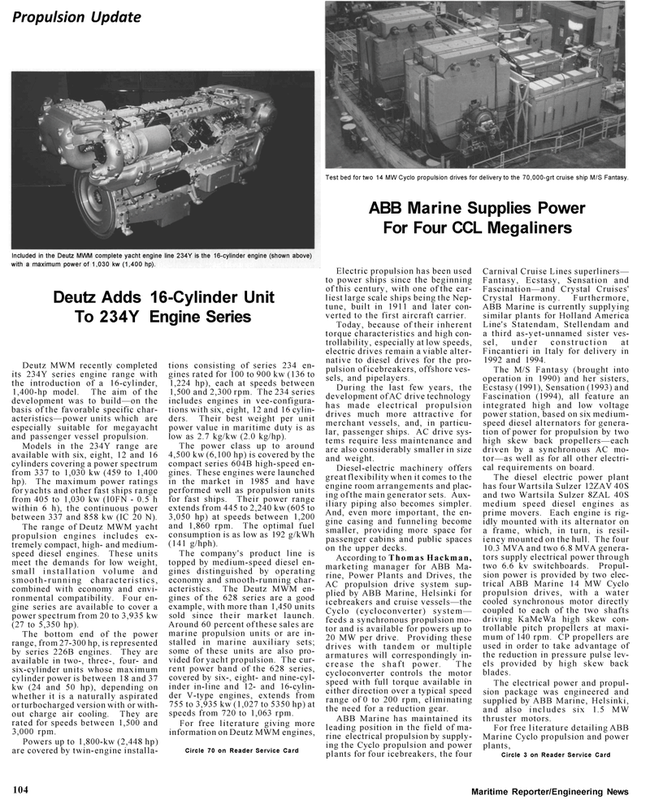 Around 60 percent of these sales are marine propulsion units or are in- stalled in marine auxiliary sets; some of these units are also pro- vided for yacht propulsion. The cur- rent power band of the 628 series, covered by six-, eight- and nine-cyl- inder in-line and 12- and 16-cylin- der V-type engines, extends from 755 to 3,935 kw (1,027 to 5350 hp) at speeds from 720 to 1,063 rpm. Electric propulsion has been used to power ships since the beginning of this century, with one of the ear- liest large scale ships being the Nep- tune, built in 1911 and later con- verted to the first aircraft carrier. Today, because of their inherent torque characteristics and high con- trollability, especially at low speeds, electric drives remain a viable alter- native to diesel drives for the pro- pulsion of icebreakers, offshore ves- sels, and pipelayers. During the last few years, the development of AC drive technology has made electrical propulsion drives much more attractive for merchant vessels, and, in particu- lar, passenger ships. AC drive sys- tems require less maintenance and are also considerably smaller in size and weight. Diesel-electric machinery offers great flexibility when it comes to the engine room arrangements and plac- ing of the main generator sets. Aux- iliary piping also becomes simpler. And, even more important, the en- gine casing and funneling become smaller, providing more space for passenger cabins and public spaces on the upper decks. Cyclo (cycloconverter) system— feeds a synchronous propulsion mo- tor and is available for powers up to 20 MW per drive. Providing these drives with tandem or multiple armatures will correspondingly in- crease the shaft power. The cycloconverter controls the motor speed with full torque available in either direction over a typical speed range of 0 to 200 rpm, eliminating the need for a reduction gear. Fincantieri in Italy for delivery in 1992 and 1994. Fascination (1994), all feature an integrated high and low voltage power station, based on six medium- speed diesel alternators for genera- tion of power for propulsion by two high skew back propellers—each driven by a synchronous AC mo- tor—as well as for all other electri- cal requirements on board. The diesel electric power plant has four Wartsila Sulzer 12ZAV 40S and two Wartsila Sulzer 8ZAL 40S medium speed diesel engines as prime movers. Each engine is rig- idly mounted with its alternator on a frame, which, in turn, is resil- iency mounted on the hull. The four 10.3 MVA and two 6.8 MVA genera- tors supply electrical power through two 6.6 kv switchboards. Propul- sion power is provided by two elec- trical ABB Marine 14 MW Cyclo propulsion drives, with a water cooled synchronous motor directly coupled to each of the two shafts driving KaMeWa high skew con- trollable pitch propellers at maxi- mum of 140 rpm. CP propellers are used in order to take advantage of the reduction in pressure pulse lev- els provided by high skew back blades. The electrical power and propul- sion package was engineered and supplied by ABB Marine, Helsinki, and also includes six 1.5 MW thruster motors.